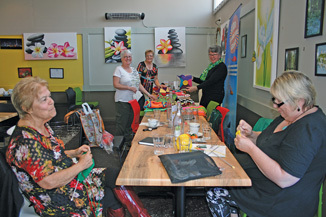 There’s a mystery group of women busily knitting decorative squares to “dress” some of the trees around the Otaki railway and downtown shopping centres. The Otaki Mail team spied them busily at their work over morning tea at the Riverstone Café recently, working on the 170 squares for needed for their next yarn bombed tree – location is their secret, but watch out for more gaily dressed trees around the town! Previous articleSpring safety: Are you at risk of running over your kids?